A new iPad and cheaper Logitech-made stylus were announced yesterday. Yesterday saw a raft of exciting updates for iPad evangelists as Apple revealed a series of announcements at its Chicago education event. Headlining the hour-long presentation was the launch of a new iPad with Apple Pencil support, and a cheaper stylus made in partnership with Logitech. Touted as an affordable iPad with stylus support, the new device is a refreshed version of the 9.7-inch model. As well as boasting support for the Apple Pencil (which will still be sold separately), this new iPad also features Touch ID, an HD FaceTime camera, Apple's A10 Fusion chip and 10 hours of battery life. Despite being sold as an 'affordable' iPad, this new model, retailing at $329, is the same price as the previous 9.7-inch tablet. However schools will be able to grab them for $299 per unit. The Apple Pencil hasn't budged on price either, and will still set you back $99, or $89 if you're a student. However, if you're still finding this a little steep for a stylus, an alternative is now available for educators. The Crayon is a third-party stylus developed by Apple in partnership with Logitech and is designed to work on iPads. As well as creating a cheaper Pencil alternative, Logitech has also developed a new rugged iPad case and keyboard combo. Both devices are currently only available for educators to order and aren't on offer to the general public. These announcements came the day after Google revealed its new Chrome OS tablet. In a cheeky move the search engine giant pipped Apple to the post by launching tablets targeted at schools, which run on Chrome OS and come with an in-built Wacom stylus as standard. 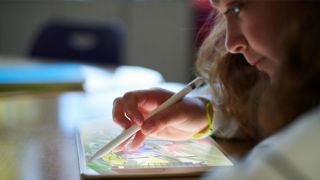 With the pressure now on Apple to compete with Google – which already has a foothold on the education market and has met Apple on cost – it remains to be seen if Apple will budge and make the Crayon available to a wider audience.